Hello all, anyone reading this. I feel like writing a quick and boring post. You know, just to talk and say hello and see what’s going on. I really like having this blog. It’s fun. It’s been an amazing – and needed – outlet over the past two years. I’m getting a little bit of regular traffic now, which is cool. Two posts in particular (my small house one and my date night boxes one) are bringing in people, which is cool. Life has been good here. KP got a steady day job doing copy writing for movie/tv trailers while working on other writing on the side. I’m doing the three-part-time-job-juggling-while-at-home-with-the-kids thing. I started writing weekly articles for I Believe In Love, which has been awesome, and you should check out here if you haven’t yet. KP and I wrote a difficult blog post last weekend. I didn’t advertise it or put it on facebook or anything though. We’re still a bit anxious about it, so I’m kind of keeping it on the DL for the moment. But you can read it if you’d like. It’s about two things: how emotional abuse in marriage starts and how this very blog came to be. With that last blog post and the articles that I’ve recently written for I Believe In Love, and the culmination of all the marriage-related posts I’ve previously written on this blog – I feel like I’m finally at a good place. That I’ve been able to process that hard time period we went through. Our marriage is at a very different place today an I’m very thankful for this…and I’m starting to feel as though I’m ready to move on from talking about that difficult time. Things that happen in the past do affect the future and need to be processed and emotionally dealt with…and eventually moved on from and make the best of it that you can with what you have. A picture because my kids are cute. 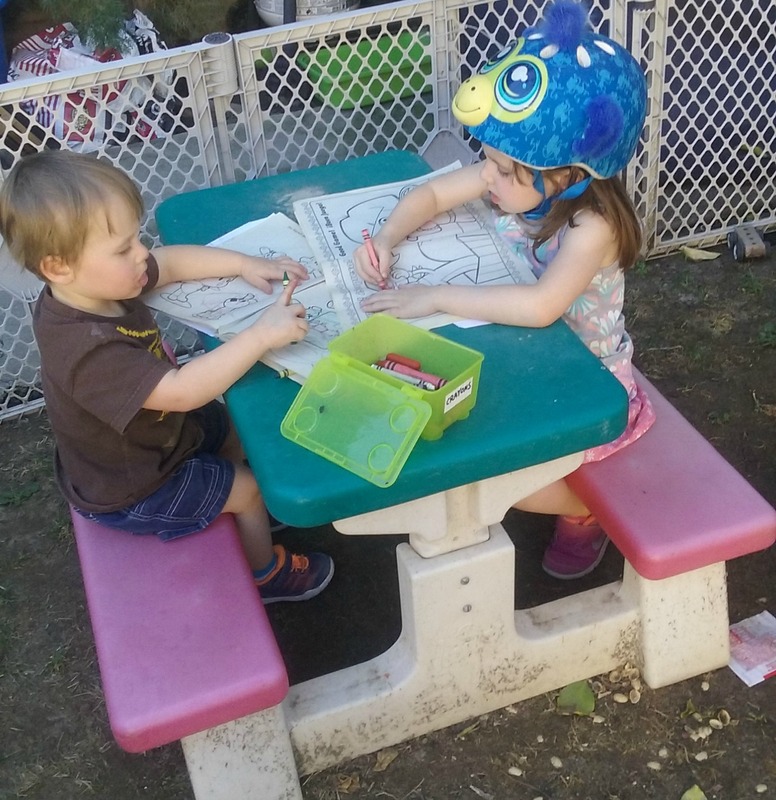 Big Sister C got coloring stuff and brought it outside for both her and S; she becoming a very sweet and helpful big sister. And she likes wearing her bike helmet as a hat. Oh, and there may be other things to report soon as well, that complicated the matter some. I finally made a decision. Well, KP and I made the decision, but I’ll admit that *I* had far more say in the issue. KP and I did a bad job of discussing this issue before it was smack dab in front of us and ended up making a hurried and last-minute decision. I’ll write more about this later. I think I’m still letting it all sink in. I will have a Kindergartner – a school-aged child – next year. I feel like my entire identity as a parent is completely being altered forever. Until the fall though, I feel like – for the time being – that KP and I are kind of settled into this chill place. He’s working regular hours, we have a good idea of our income each month, I’m the primary caregiver of our kids, while doing these other things to supplement our income. And that’s just how our days work. For the moment, we actually feel like a “normal” family life. And it’s kind of nice. But I’m also kind of looking forward and wondering when our next exciting, crazy, hopeful burst of activity will be. It’s Spring again (especially in SoCal) and I’m starting to get my garden all set up. I put all this time into my garden every year and then I let it all die back once the heat of summer hits…but then I do it again next Spring, always telling myself that THIS is the year where my garden is going to be the awesomest ever! And I seriously think that this year my garden is gonna rock too. Thanks for the update and for the post on emotional abuse. That has been an issue at times in my marriage as well so I really appreciate someone talking about it. Glad to hear you guys are in a good place now. I also will have a kindergartner this fall and am girding my loins for another garden attempt.